Aluminium is the most common metal on earth. Aluminium is 100% recyclable without degradation of the material. Remelting aluminium cost a low amount of energy, only 5% compared to initial production. 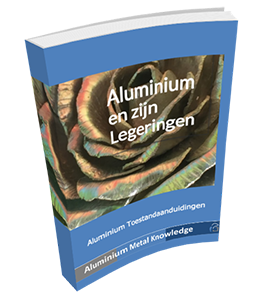 Aluminium is a light material and therefore saves energy during transport and lifetime. Aluminium has great malleability, you can create all kinds of forms and the forming requires low amount of energy. Aluminium has a high specific strength, so strong and light at the same time. Function integration possibilities are huge, due to high deform-ability parts can be reduced saving time effort and money. Easy and fast to machine with long tool lifetime. Aluminium is highly corrosion resistant, therefore maintenance is relatively low, saving cost energy and effort. Aluminum waste equals money, this is the autonomic motive why aluminum is recycled so much. It requires a better understanding of the design possibilities, there are so many options to from your product. Aluminium is flexible. If you need stiff products you have to acquire better design skills in order to solve this via design. Relatively low melting point (660°C pure aluminium) which allows you to use low energy in order to form your product. Aluminium is relative un-noble, design for corrosion requests more knowledge to make use of the passive protective oxide layer and prevent problems like galvanic corrosion by false design. The application of aluminium requires an pH neutral environment. In basic or acid environment the protective oxide layer will decrease. There is a wide variety of alloys which are used depending on the design need, luckily there are 8 main categories which are well defined. Aluminium is sensible for fatigue like most metals, you need to consider the aluminium design rules in order to create a robust design in dynamic application. But it allows you to create predictable interval inspections. Aluminium transfers heat, for fire or welding application it cools the heat and more energy is required to increase temperature. Due to its corrosion resistance it takes relatively long to decrease back to aluminium oxide in nature in dry environment keeping your product save. You won’t find it back in nature when it decreases since the earth crust consist of 8% aluminum oxide, aluminium will not damage the environment. What’s your reason to use aluminium for your product? Let me and everybody know by commenting on this blog and I will sent you the checklist for aluminium product design. – lager gewicht, excentrische huls in balhoofd motorfiets. – kortere doorlooptijd, frame voor machine opbouwen uit alu extrusie profielen ipv stalen kokers. – kosten, omzetten van bewerkte delen naar extrusie profiel.